Last summer, Dan and I went with a bunch of my work-friends to a new bar/brewery, Resurgence. Their concept is vastly different from others, in that its located in an old warehouse, they use picnic rather than pub tables, and there’s not a single television to be seen. Their thought is to throw trivia cards on a table and lawn games on an open floor to encourage conversation amongst friends (what?! no electronic distractions? love it). 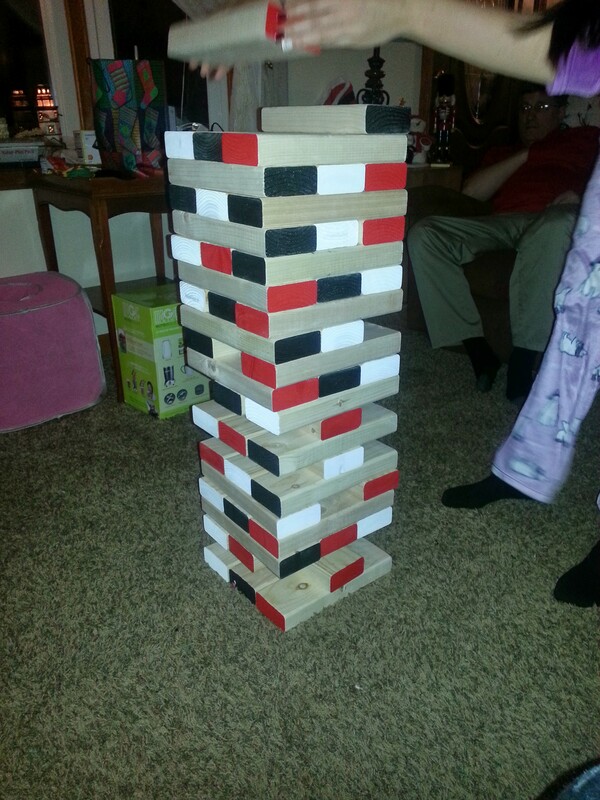 Anyway, we almost immediately got caught up in a game of giant jenga. 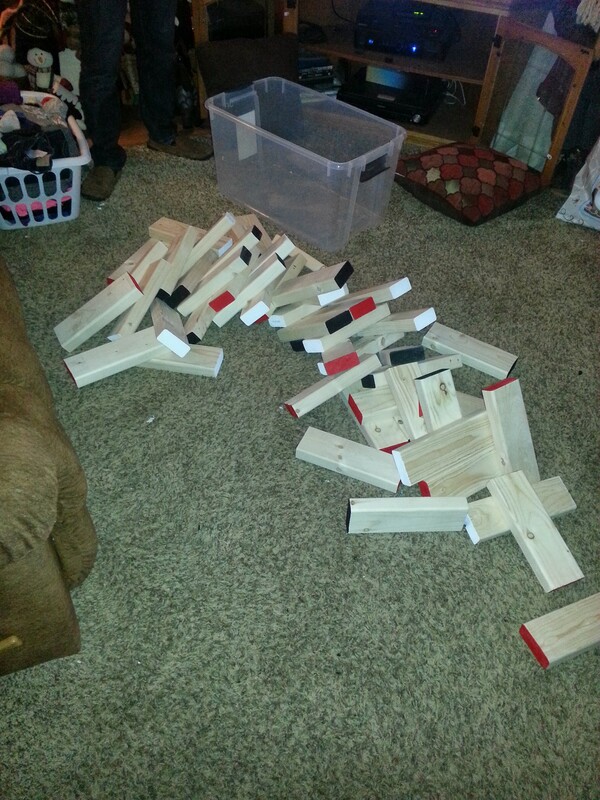 Just like the old table-top game, except life-size… literally. 2x4s stacked waist high to start, so you can only imagine how tall it got by the time we were done. Safe to say, it was a blast, and inspiration for a new DIY project was born. 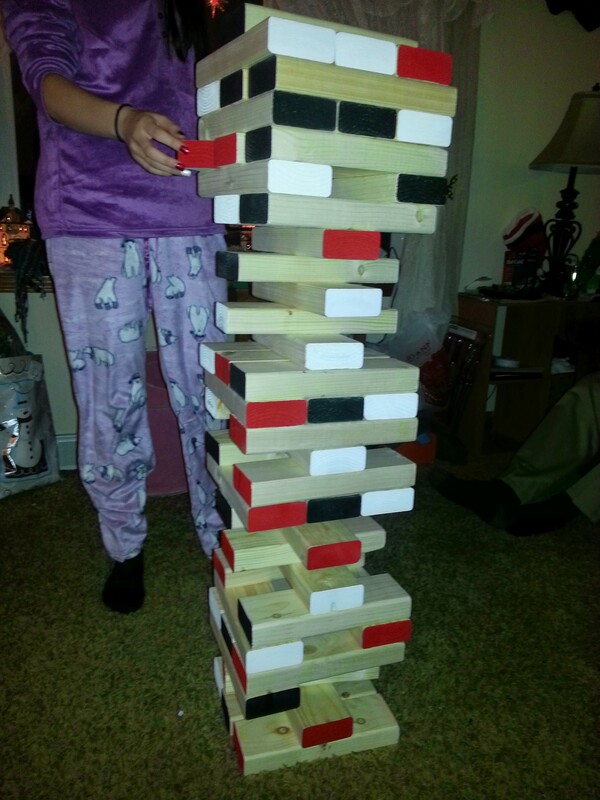 It wasn’t until Christmas rolled around that I would make giant jenga a reality. Dan and I are saving for a house and decided to have a small Christmas, so I thought this would be the perfect gift. After a bit of research, all that was really needed were 54 10.5” 2x4s (say that 10 times fast). I enlisted my Dad to take a trip to Home Depot with me, and after searching through 2x4s for quality pieces, we ended up with 5, 12’ boards. Those were fun to get home, hanging out the back of his SUV. Luckily, its only about a mile or two away. Side story: Dan and I are constantly working on projects in my basement and garage. So when I brought the boards home, I quickly found that you can’t hide 12 foot 2x4s very well. It was a pain, but my Dad and I had to throw them in the rafters overnight so that Dan wouldn’t see them and catch on. Because he catches on to ev-er-y-thing, and I literally can’t hide anything from him. As an example, minutes after our Home Depot trip, Dan asked what I was doing there… in the lumber section. No, he’s not a stalker. His family friend happened to be there at the same time and mentioned to his Dad that he saw me. Great. How do I hide that one? Tell a little white lie of course – “Well, my dad is fixing my uncle’s back porch and we had to get lumber for it.” Who fixes a porch in the middle of winter? Oh well, it worked enough for him to not ask more questions. I call that a success. And back to work we go. After a sad attempt of using a circular saw (I gave up after three pieces), my Dad and I quickly moved on to a miter saw that my Nana has in her basement. Dan and I have used this on multiple other projects, so I was able to use what I learned from him to make his present (see how it comes full circle). Once we made all the cuts, the rest was pretty easy (although, time consuming with the number of boards there were). 54 pieces to hand sand – yay. I added a finishing touch by painting the ends black, red, and white. A tribute to our Polish heritage, and his time spent growing up playing hockey for St. Francis and the Cheektowaga Warriors. Back to that side story: I was actually able to keep it a secret from him the whole time. And he didn’t figure out what the gift was until just before he unwrapped it, because he likes to shake things to figure out what they are (like a small child, I know). Quite the accomplishment though, because he usually guesses before even seeing the wrapped gifts by asking too many questions. He can read me like a book.